Well folks, it's been a long and wonderful Ride To Pandamonium. I got to "see" a ton of our amazing country and put a smile on people's faces along the way. Especially in the gym, in the panda suit... that was one for the books. Hehehe. What began in mid November ended in early Jan. I finished the 1413km from Jhb to Camps Bay and raised much needed funds for a free ambulance and paramedic service in Joburg called Hatzolah. I couldn't have done it without all of your support and donations. So... THANK YOU! 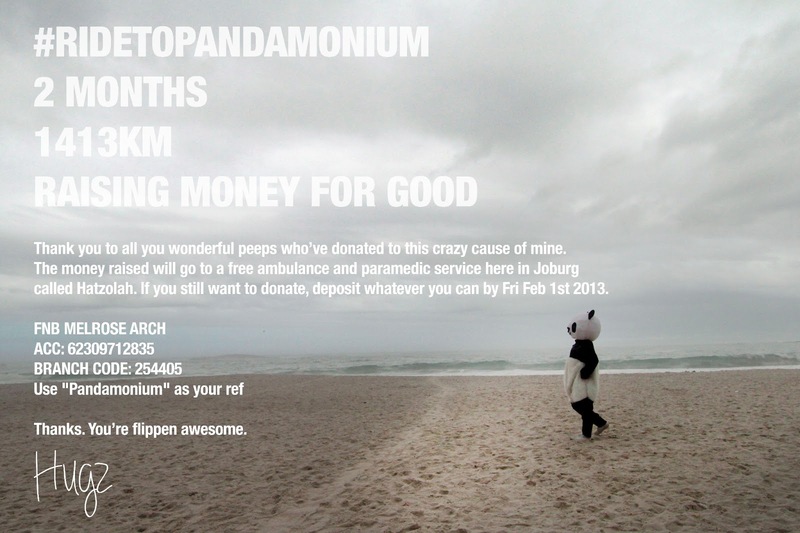 If any of you out there still wish to donate to the cause, pls do so by end of day tomorrow (Fri Feb 1st 2013). The deets are in the pic above. Thanks again. You're flippen awesome. Peace.